This is a review of the Large version of the Kata D-3N1-33 3 in 1 Sling Backpack. So you just got a nice new Nikon D800 or D4. What, you shoot Canon? 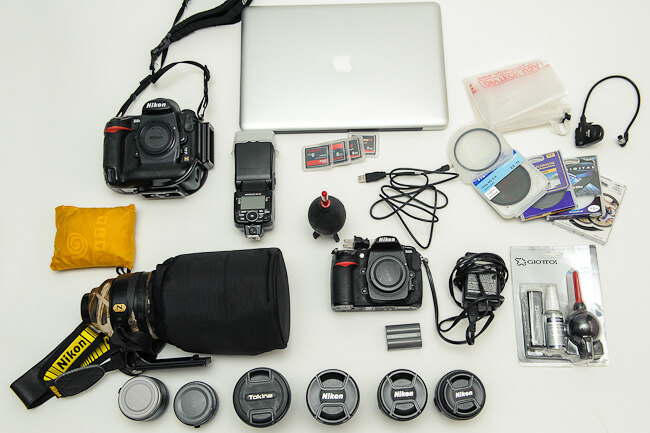 OK, you just got a new Canon 5D Mark III or 1D X, now what do you carry it in? You can read a number of reviews about bags, most of them written after they were used briefly after purchase, but how about a review after long-term use? I have had this bag for 2 years, having purchased it shortly after Nasim recommended it in his “must-have DSLR accessories” post. Since then, it has been my main gear bag for travel. The 3N1-33 Sling Backpack is designed for a Pro DSLR with battery grip & long-range zoom lens attached, 5-6 lenses, flash and personal gear, OR a compact camcorder with accessories. It also accommodates up to a 15.4″ laptop and personal gear. This unique bag provides ultimate freedom and allows for three carrying options in one, morphing from sling to backpack and back again. In sling position, the bag easily swings around from back to front to provide quick-draw access to your main camera/camcorder and backup lenses, as well as fast and easy changing of lenses. In backpack position and “X” position you can comfortably carry your equipment for long distance walking when needed. Arrange your equipment in the bottom main compartment of the pack, taking full advantage of the modular dividers to custom fit the bag to your equipment. The large top compartment will hold personal gear or additional gear, and the internal pockets and mp3 player pouch will allow you to organize your personal effects as efficiently as your photographic gear. Two external pockets allow quick zippered access to accessories without opening the main compartments. 1.2) What’s in the bag? Weight when fully loaded: 33 lbs. I have traveled with this Kata 3 in 1 Sling Backpack extensively and one thing I really like is that fully loaded, it fits just under the seats on airlines. The only problem that I have is if it is fully packed, the hip belt can get in the way sliding it up under the seat in front of me. While I like the variable strap system that gives me the flexibility to adjust which shoulder or both, to carry it with, I don’t care for the hip strap/pad – mainly because I don’t use it and it gets in the way. I like the fact that when a shoulder strap is not in use, it tucks into the bag and out of the way and wish there were a similar way to detach or stow the hip belt. Obviously, if you use the balancing hip strap, you may feel differently. 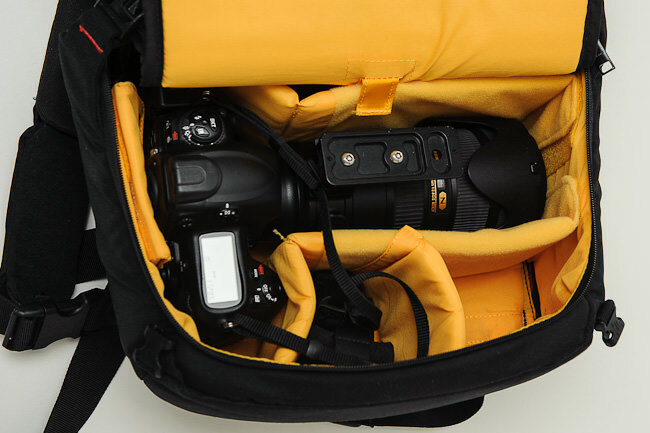 Although the bag can carry a lot of weight, the bag itself is relatively light at a minimum of 3.24 lbs/1.47kg depending upon the dividers and accessories such as a tripod holder. One piece of advice: On one flight to Australia, I did run into a problem as the airline had a carry-on weight restriction which I was unaware of, and although the bag fit, the weight was over the limit and I had to repack, so be aware of specific rules that may apply to your flight before you travel. I really like the multiple zippers that allow accessibility from different points. You can pack a ton of gear in various bags or packs but if it only has one opening, you have to take everything out to access whatever you are looking for (unless of course it is on top). With the Kata 3 in 1 your gear is accessible from the front or from either the right or left side making it easy to get to what you need especially if used in Sling mode. Just make sure to reverse the lens hood. I have used and abused this backpack for 2 years now by over stuffing it and carrying it thru multiple cities and airports and it has held up extremely well. I cannot find any torn material or popped stitches and the seams, zippers and straps have held up perfectly. This bag has done everything I have asked of it without breaking down as I have carried it, stowed it and crammed it underneath seats on planes. Like many bags, the Kata 3n1 gives the user flexibility to customize the compartments for their needs and the padding is adequate for carry on travel. 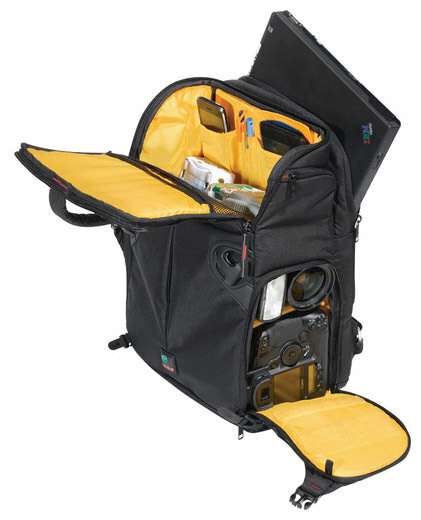 Separate from the main body and lens compartment is an additional compartment to store accessories and provides multiple pockets and spaces for filters and batteries and extra cards. 5) A Travel bag vs. a Backpack for hiking? The answer depends on how much you carry. Personally, I consider this more of a travel bag, than a backpack for gear. In fact, Kata makes an optional trolley or two-wheeler to provide another way to transport the bag, should it be too heavy. If you have a carry-on roller suitcase with a handle, the Insertrolley strap will slide over the handle providing a convenient way to roll the Kata 3 in 1 on top. The pack itself has a soft shell, and as such, no real frame that you might like if you were doing a lot of backpacking, so if you had this bag loaded, you may not want to hike very far. If it is lightly loaded I am sure it would be acceptable, but there is very little rigidity to the bag, which helps when trying to stuff gear into tight spaces, but it isn’t so great for serious backpacking. I will review another option for hiking in the future. If you choose to pack a bit lighter and use it as a backpack, then you may wish to use it in the sling mode which allows for you to swing the pack from your back around to in front. While the pack is in front of you, you can quickly access your gear from the side of the pack. With the pack in sling mode and in front of you, the pack can serve as an elbow rest giving you more stable support to hold the camera. The hip belt/pad is thinly padded which again is good for carrying through an airport or on a short hike but might be inadequate on a long hike if you pack heavy. Regardless of the length of the walk, the included rain cover is a nice touch should you need it. I love the flexibility and durability of this bag as it allows me to carry a good amount of equipment and still slide it under the seat in front of me on a plane, thus allowing me to still have a regular carry-on suitcase for the overhead bins. It is an excellent value for the price compared to some competitive bags/packs. While the Kata 3 in 1 comes in various sizes to fit your specific needs, I only reviewed the D-3N1-33 3 in 1 model for this post. So what is your favorite big bag for gear and why? Good review, Tom. Thanks for posting. I have had a number of Lowepro bags over the years. Your review backs up what I have heard regarding Kata’s quality. I’ve purchased the Thinktank Streetwalker Pro after buying the 70-200 mainly because I needed to fit a lot of computer parts in it (I also bought myself a PC from the states) and wanted to carry it back to Europe as hand luggage. Besides the 70-200, I had the following things in it: my camera, D90, 18-105, tripod head, the CPU, video card, SSD, HDD, memory, Kindle DX, large headphones and some other small stuff like filters and Ipod. It was PACKED and I’m telling you, this backpack is as spacious as an international airport hand-luggage can be. It weighted 10 kgs (22 lbs) and helped me pass flawlessly through customs. I also like hiking, do you have some tips on carrying a DSLR + lens during a few days to a week long trips? I usually find a place for the camera in the mountain backpack, but it is quite cumbersome to get it out, take shots and stuff it back in. George, thanks for the comment. Yes, the Think Tank line of bags are always well reviewed and they are built literally, like tanks. Everyone that has a Think Tank bag, loves them. As for the hiking question, for a week long hike, I would hire a sherpa. Ha Ha, just kidding. By your last name, I am guessing you are from Romania and have the pleasure of hiking the Carpathians – beautiful mountains! The best advice I might give, you already know and that is to think of what you want to target on your hike and limit the gear to that. Of course, that means that invariably, you will be prepared for wide angle landscapes when the incredible wildlife shot of the bear or lynx presents itself. Underwater photographers face that problem all the time since they can’t change lenses underwater. They prepare for a macro shot and a wide angle shot presents itself. Depending on your priorities, and physical abilities, you will figure out what to pack. There are chest packs for cameras which can give you quicker access, but obviously, it is more gear to pack and more cumbersome. Good luck and have fun. IBM? What year was this made? Love KATA! PL-220 rocks! A bit big, been looking for something smaller. Haha! IBM! Nice catch, that pic was from the Kata Website, my pic with my gear shows a 15″MacBook Pro. Thanks for noticing! :) As for the Kata 220-PL – that is a serious bag! Thanks for the comment Jeremy. Lenovo used IBM badge on their laptops up until about 2008, so not really that old. My new laptop doesn’t come with IBM badge but the ThinkPad badge remains. The bag, as you said, is not optimal for hiking. I took it for several hikes as-well as for skiing (light packed), if one chooses the X setup for the straps and wears the hip belt, it is acceptable but not optimal at all. Additional to the lacking frame I felt the “ventilation system” for the back not quite effective and the X position of the straps do not help for ventilation either. Although the big upper compartment offers quite some space for personal stuff, I find it to small for longer (all day) hikes. Thus I am very interested in your review on a proper solution for hiking. For now, I might switch to my regular hiking backpack and put my photo stuff in separate pouches inside the backpack for longer hikes. Thanks for the review. Maybe a little off topic. Selection of Lowepro, Kata, Tamrac. P.S. I am an amateur photographer. I’ll be happy to take any advice about the choice of bags. Thank you Pol. 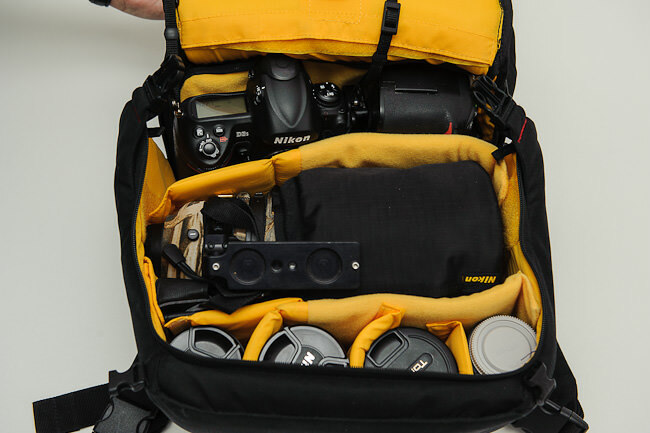 As it stands, most of your gear would fit in a smaller bag than the one reviewed here. If the bag is big, then there is a tendency for me to not want to carry it, so buying a bag bigger than you need can be a deterrent to using it. One suggestion is to go to the Kata website, they have a variety of bags and one that would fit your needs. The website is very complete and they have a “Bag Chooser” link to help you find one for your needs. 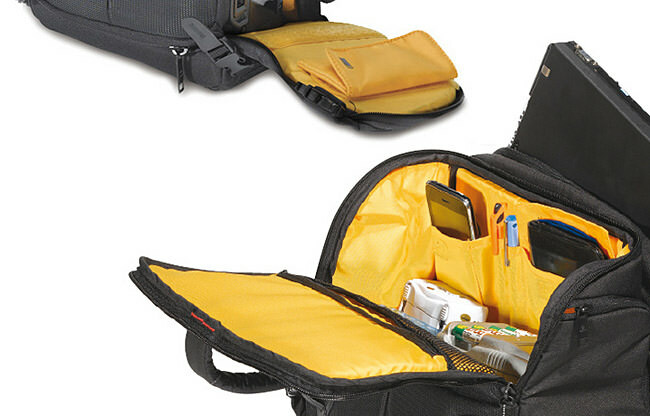 There are other bags that people really like, Think Tank, makes excellent bags and so does Lowepro. You may wish to try their websites as well. As for water protection, since you mentioned it, some bags have zippers that are more watertight than others, I have one from Lowepro that is good. Some bags, such as Kata provide a rain cover that you can slip on as needed. The gear kit you have looks nice and will serve you well, I hope this helps some. I read a lot of reviews on camera bags. In most of reviews, the authors were able to pack a lot stuffs in these bags which I usually have hard time doing. Any chance you will write a article to provide tips on packing bags? I think it will be helpful to some of us. Hi Bryan, Since most bags have padded dividers with velcro, the compartments are flexible to your needs which can change depending on the gear you choose to take. After you have the bag, you get to where you arrange things fairly efficiently. I hadn’t thought about an article on packing, but thanks for the suggestion and maybe we can add that to a review. My favourite part about it is that I take the insert from the pack out when home and use it to store my gear in an easily accessible drawer in the kitchen (I’m not a pro) because I like to be able to grab my camera at a moment’s notice. HI Jane, Thanks for the note. I checked out the link you posted and the Tenba looks to be a solid bag and the insert that is removable is a nice touch. Thanks for sharing this one. Kata – Israeli bags! awesome! I bought one of these, and although I liked it, I had to return it. I didn’t feel comftable on my back, on the verge of being annoying. The materials used are firm, but that also means they are not pleasant to the touch. Rotating the bag to take out the camera is not as easy as shown in the videos posted on the website. Oded thank you for the feedback, out of curiosity, what did end up purchasing , if anything? And how do you like it? Tatan, thank you for the feed back for sharing the bags you like. I agree that carrying smaller bags/packs whenever possible is much nicer. 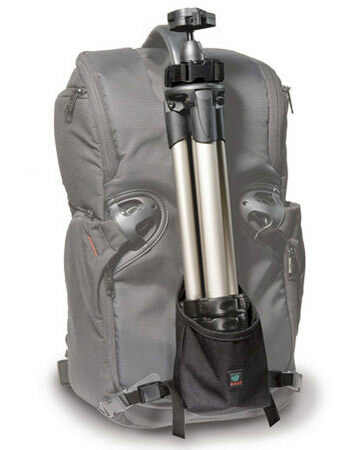 Do you (or any of the readers) have a recommendation for a bag for carrying on day hikes a Nikon D700 w/grip and the 500mm f/4 VR lens, a set of teleconverters and a tripod/monopod along with some small accessories? I am satisfied and accept that I don’t want to pack every lens I own on my back. When I go hiking for landscape views or non-bird nature I can easily pack my 70-200 and 14-24 along with some tubes (for macro) and teleconverter or two for opportunistic birding. But when I go for birding, the 500 is all I really want to carry and if I miss some other shots, I am ok with that. Think Tank Glass Taxi It does not have room to allow the body and lens to be attached, however. The Kata TLB-600 PL – has an aluminum frame and good padding. Why would anyone spend endless time and money searching for the ultimate bag when the search could easily end with a Billingham bag? Billingham bags are waterproof, solidly constructed, offer unparalleled camera protection (albeit unstructured), easy access to its contents, and quality leather and canvas. Of course, I not only speak for myself but many others have agreed there is none to compare. I have a friend, very serious amateur, who loves his Kata 3in1-size 20, and I understand why. But I need a little larger size to hold a Sigma Bigmos 50-500 zoom attached to a Nikon D-90 — which totals 11.75 inches (rear of body to lens cap) when attached to the Nikon. Will that fit in the main compartment of the 3in1-size 33? Also, while I do not carry a laptop, I do carry a GoreTex shell jacket in case it rains and I want to keep ME dry in addition to the camera gear. I am wondering if the laptop compartment is big enough to slide a (non-insulated) GoreTex shell or a poncho into it. Hi Rod, thanks for the question. I have a Sigma 150-500 OS and it fits, but I do not leave it attached. I know that your lens will fit unattached but am not sure it will with the body attached. According to the dimensions supplied by Kata, it will be very tight, although there is some flex in the walls of the bag. As for the shell, that really depends on the thickness of the shell. I have a rainjacket made by Go Lite that will fit in the laptop compartment, but it is a very thin jacket – nice, but thin. You could also place that in the upper compartment of the Kata, as it has room for a shell but I don’t know what else you plan on carrying. I don’t know how much gear you plan on carrying and for how long a hike, but this bag has no rigidity and if you are doing serious back packing, you might look at alternatives. Tom, thanks so much for the quick and informative response. The Sigma Bigmos 50-500 (which I am renting for a photo cruise to Alaska) is about 1.3 inch shorter than the 150-500 (you said 15-500 but I’m assuming you meant 150-500), so hopefully it will fit. In terms of length of hike, I suspect a couple of hours will be the longest I would carry it, so I am not too worried about needing a more rigid/shaped backpack. Rod, I did mean 150-500 OS version. Thank you for the correction, I will make an edit. Have a great time in Alaska, you will love it!! It is a photographer’s dream with landscape and wildlife. Safe travels and let us know how it works out for you. Thanks for this review, it is nice to see how versatile it is. Might be my next bag? Thanks a lot for this review. It’s a great prod..
Also, would you feel that Kata PL 3in1 35 would be equally good buy? Asheesh, a pack with a frame will take some of the weight off your shoulders and redistribute it say, to your waist, making it easier on your body for longer hikes. Is Lowepro Pro Runner 350 AW worth the price? 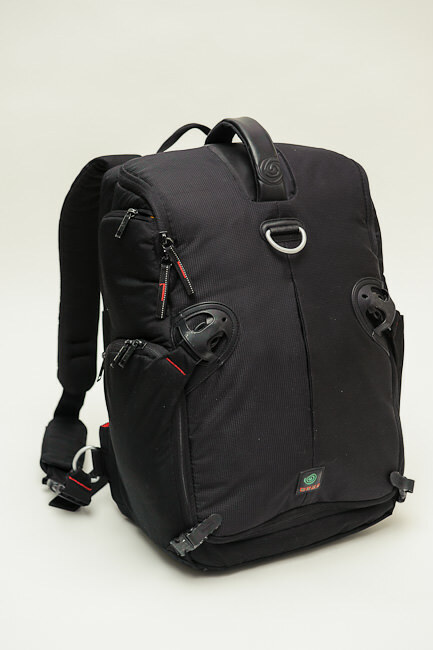 Or Kata D-3N1-33 3 in 1 Sling Backpack is way better than lowepro 350 AW? Faz, I haven’t used the Lowepro 350 AW so I can’t comment directly on that, but Lowepro makes good products. Thanks Tom.. Currently i have lowepro 200 AW, however wanted to know if Kata is worth the price. The sling thing is helpful or not. Lowepro makes good product. DR. REDD, I HAVE NIKON D 700, 28-70MM 2.8 LENSE, 80-400 4.5 -5.6 LENSE, NIKON 80-200 2.8 LENSE, NIKON 20MM 1.8 LENSE AND PLAN TO BUY ROKONON THE WIDEST ANGLE POSSIBLE. I ALSO HAVE GITZO WITH REALLY RIGHT STUFF BALL HEAD. WHAT BAG SHOULD I BUY TO FIT ALL THIS. I ALSO WANT TO CARRY A LIGHT, RAIN JACKET AND A RAIN COVER FOR THE BAG. FOR FLYING I WOULD LIKE TO PACK MY 15INCH MAC BOOK PRO IN IT. I WANT SOME THING THAT GOES ON THE HANDLE OF MY ROLL ON CARRY ON BAG. PLEASE ADVISE. I WENT TO KATA SITE THE BAG FINDER DOES NOT WORK. Dr. Kumar, it is hard to know exactly what will fit in a bag like this, you just have to try it. I can say much of your list will fit, but maybe not all. ThinkTank makes great bags and since using ThinkTank, I don’t use the Kata as much. The Kata is lighter but doesn’t have as much internal support as the ThnkTank. I use my ThinkTank Airport Commuter bag the most. Check it out.